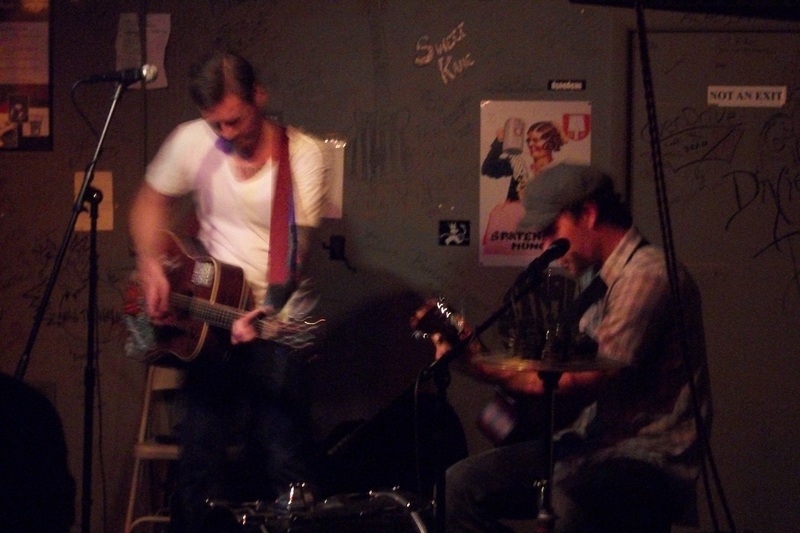 Gas Pump Talent made their way up from Springfield, Mo to play the Cafe Acoustic for the third time this weekend. Having one good turnout in St. Joe and one lackluster turnout they were hoping for an enthusiastic crowd and got it. The raw two man band tore into their set with one of their best songs with “Ella Mae Rose” right away. They then touched on their only available recording The No Place In History EP by performing the title track and high school outcast anthem “Ruler of the Elves.” The band would get a very strong reception right away from a crowd that would stay for most of their epic set. Gas Pump Talent started their music a few minutes after 11:00 and would continue to play without a break until 12:45 for a mammoth hour and 45 minutes of songs, right up until last call at the Cafe Acoustic. At one point even saying they were going to play until the crowd let them know when to stop. Gas Pump Talent playing the Cafe Acoustic in St. Joseph, MO on 4/6/12. While the band has a very healthy amount of original songs they would once again mix in several carefully selected covers. The covers included songs by Merle Haggard, Johnny Cash, Lucero and Social Distortion. The Merle Haggard song “Old Man From The Mountain” has become a staple in the Springfield, Mo band’s setlist. Lucero’s “All Sewn Up” fits in perfectly with Gas Pump Talent’s original songs and many times would not even be picked as a cover if the band didn’t give credit, which they do. The prize for most cover songs performed went to Johnny Cash as the band did “A Boy Named Sue” “Cocaine Blues” and fulfilled a request with “Folsom Prison Blues.” A large block of mostly covers was ended with back to back Social Distortion songs in “Sick Boy” and “Ball and Chain” two more very fitting songs for the band. As the band wrapped up their enthusiastic show they hit on more original songs including the live favorites “The Booze Tastes Like Blood” and “The Duck Song.” The band would end their show the same way they began it; by reprising the song “Ella Mae Rose,” The crowd didn’t seem to mind hearing it again one bit. The only disappointing part of the evening was that more of Gas Pump Talent’s songs aren’t available to buy. Their only recording is the 6-song No Place In History Ep. While it is a very good collection of songs with “No Place In History” “Ruler of the Elves” and “Born On The Fourth of July” the band has many other very good originals that I’m sure audiences would be eager to buy. The most notable of these songs are “Ella Mae Rose” and “The Duck Song.” Hopefully the guys will travel north again soon with some t-shirts to buy and some more of their concert staples put on a cd. This entry was posted in Concert Review and tagged A Boy Named Sue, All Sewn Up, Cafe Acoustic, covers, Ella Mae Rose, Gas Pump Talent, Johnny Cash, Lucero, Missouri, MO, No Place In History, Ruler of the Elves, Sick Boy, Social Distortion, Springfield, St. Joseph, The Duck Song. Bookmark the permalink. Good review. Never heard of the band, so I Googled them. Their official site says it is unavailable, but I listened to a couple of tunes on Myspace and liked them. Do they ever venture outside of MO? I think they are still very regional. I don’t think I’ve seen them go too far away Missouri. They are a very solid band, it’s a shame there are so many really talented bands that can’t get the fanfare they deserve. I have to say they( Gas Pump Talent ) were awesome, I had never heard of them before and they put on a show well worth the stay for the rest of the night. I also purchased a cd and wished the playlist was longer. Looking forward to seeing them again,and another cd would be great!